Cancer thrives in an inflammatory, acidic, oxygen poor environment so whether we are currently in a battle with cancer or trying to live a cancer-free lifestyle…choosing the right cancer fighting foods is mandatory. 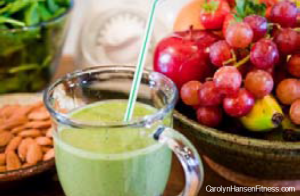 Some cancer fighting foods you are likely avoiding because you don’t care for the taste or texture by themselves and this is where the smoothie…particularly the breakfast smoothie comes in. Smoothies that include some superfoods provide a healthy quantity of anti-oxidants along other cancer fighting properties. They are quick and easy to create and a breeze to incorporate into daily life without making huge adjustments to your diet and without a doubt the fastest and freshest way to get your daily allotment of veggies. Here’s a list of cancer-fighting foods that should be included in your smoothies as often as possible. Kale: Kale is just one of many cancer fighting cruciferous veggies. Full of protein, vitamins, minerals, fiber this super dark leafy vegetable contains a compound called organosulfur and is being highly researched for its ability to both prevent cancer and cause the death of cancer cells known as apoptosis. Research has shown that cruciferous veggies offer several aspects that lower cancer risk. The health benefits of Kale cannot be denied but getting your children or even yourself to eat it can sometimes be a challenge because of the taste. Kale is easily masked in smoothies with sweet flavors from banana, pineapple or even almond milk. Strawberries: Perfect to compliment your Kale, these little red gems have proven that they can halt cancer cell growth fast. Research done for six months on 30 people at Ohio State University revealed that freeze-dried strawberries actually slowed the growth of dysplastic or precancerous lesions. Other berries can be just as powerful…blueberries, cranberries and apples all offer cancer-fighting compounds. Avocados: This bumpy skinned smooth tasting veggies is rich in glutathione a powerful antioxidant that attacks free-radicals by blocking intestinal absorption of certain fats. They offer more potassium than bananas and are a wonderful source of beta-carotene. Papaya: Papaya not only tastes great but offers many health benefits. These sunny fruits are rich with lycopene (the same benefit you get from tomatoes). Although sometimes they can be a challenge to find, it’s worth seeking them out. Other foods that fight cancer and work well in smoothies are carrots, figs, red grapes, cocoa and broccoli. Just hearing the word cancer can bring most of us face to face with fear…but there are ways to prevent and even kill cancer cells and the fight begins with diet. The body is not a weak machine. If it was we’d all be dead by now. It has amazing disease fighting abilities but you must give it the building blocks required to stay healthy and vital. You are the only one that can take the action steps necessary to lessen the chances of getting cancer by eating nutrient-laden foods and boosting your defense. Knowledge is power…if you would like to find out if you have an invisible threat hanging over your head take my FREE “at risk for cancer” test. Make today the day you turn your life and your health around.